A driver has been spotted towing a lit wood-fired pizza oven while hurtling down a motorway in Australia. 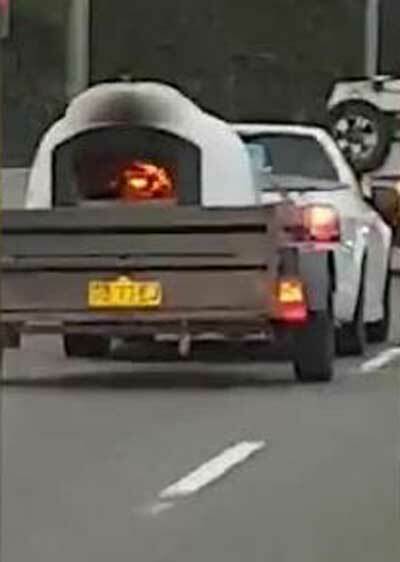 Dash camera footage filmed the wood-fired pizza oven being towed on a trailer by a pick-up as it drove along the Westlink M7 in New South Wales. "One wonders if this is very safe," Kerri Lacey, the driver of the vehicle filming the incident can be heard saying. 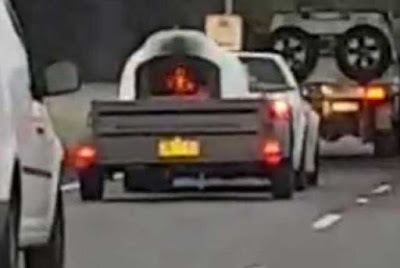 "A fire, in a pizza oven, on the freeway, with a car." It is believed the driver was not breaking the law. YouTube link. Kerri Lacey's original Facebook video. "It is legal in Australia to have the fire going in the oven. I have three of these and it took me a long time to get an answer. The police didn't know, I asked the head guy at the CFA and they said it's okay as long as you have a front door. It's no different to a steam train," Adrian Cross said.